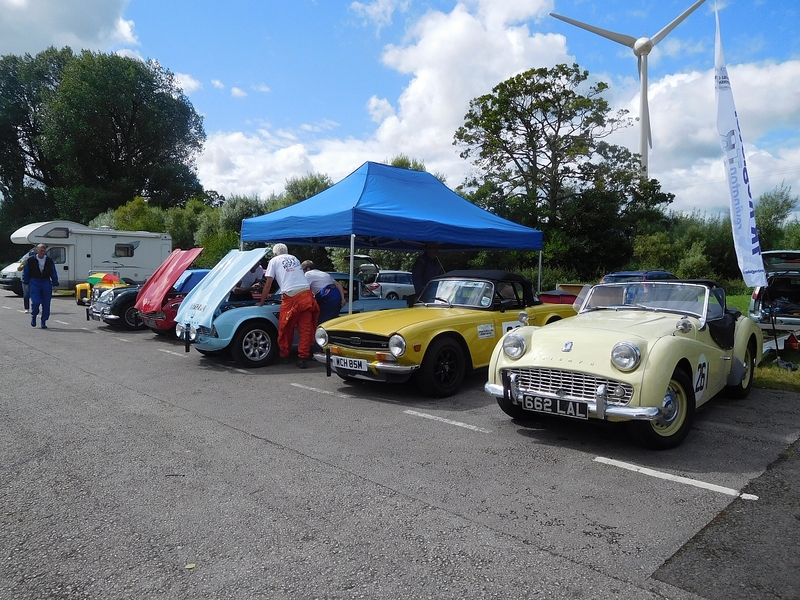 The Reliant Scimitar and Sabre Owners Club hold their annual Long Weekend at Curborough, and after their socialising on the Friday and Saturday run a Sprint on the Sunday using the long figure of eight course. The beauty of this arrangement is that there are loads of Reliants competing as well as trade stands, buy and sell stalls, and concours. 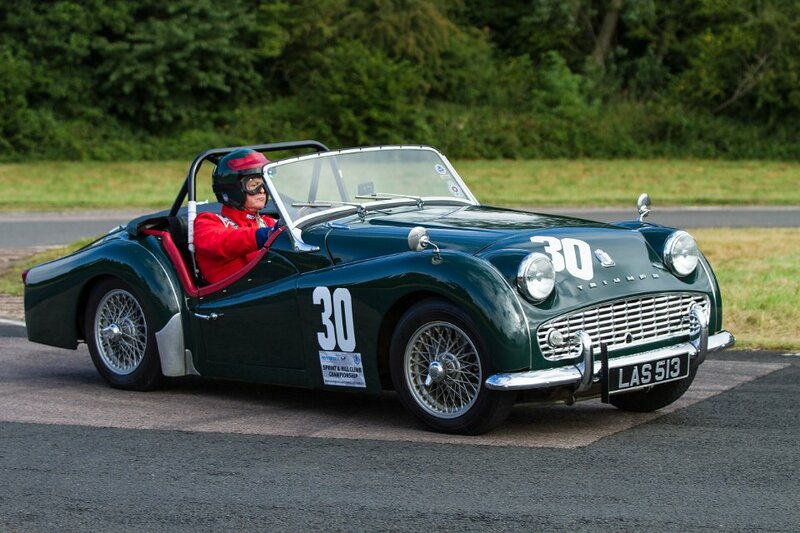 The beauty of the Curborough course is that you can see the complete circuit from the seats along the main straight and they were packed for this event. 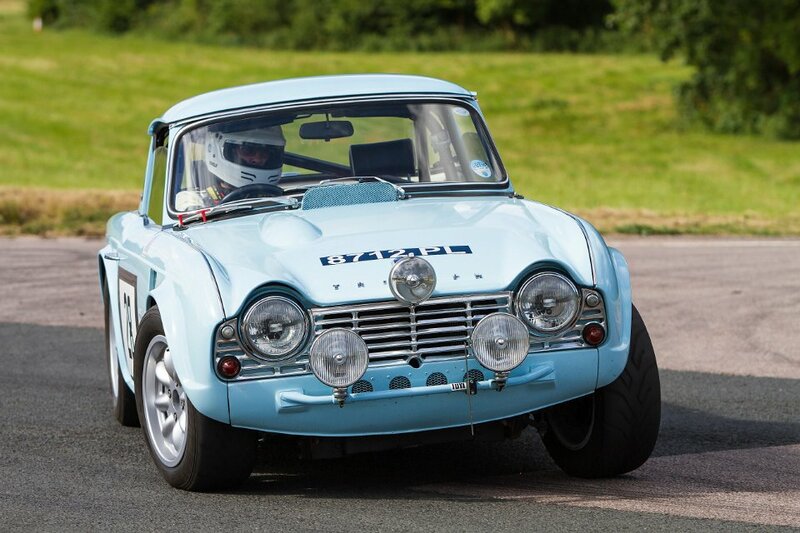 The Triumphs were all in a class for Roadgoing cars over 2000cc and there was a BMW 328i interloper, being double driven, that became the car we must beat. 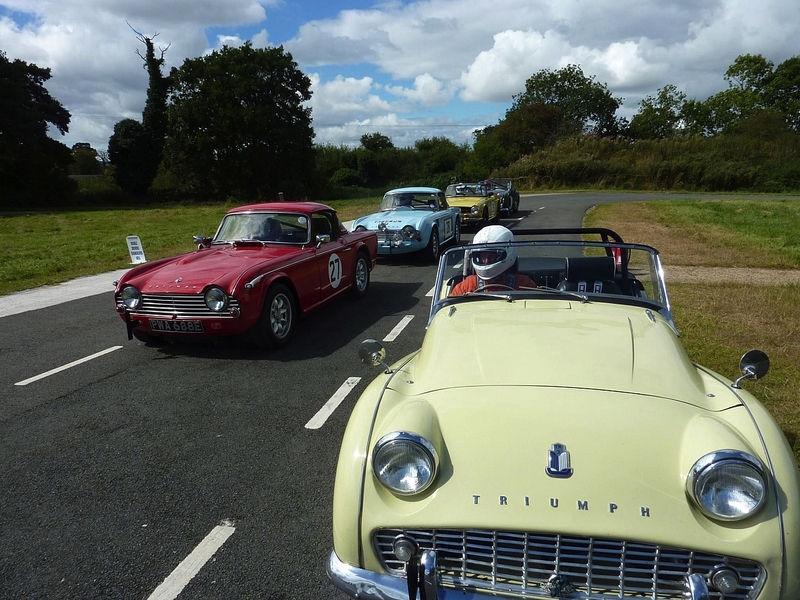 We were all TRs, an unusual occurrence this year, with Ian Prout driving Kev's TR3A, Richard Durrant second time out in his TR4A, Bob Barnard in his splendid rally replica TR4, Roger McEwen in the Witch, Tom Purves in his concours TR3A and finally Kev Bryant. Fortunately Bob had brought his exceedingly smart Hamilton Gazebo, as rain was definitely in the air and somewhere to shelter was essential. It was obvious that the morning practices were going to be on a wet track. The layout of the track is difficult to explain but imagine a figure of eight on its side with a long tail from the bottom left. The start is at the end of the tail, joining the eight and going clockwise to the top, following all along the top with the right left right in the middle. Then long right turn to the bottom of the eight and half way along turn right and then left to the top of the eight then hard left back to the bottom. Then half way along turn left then right to the top and the long turn again to the bottom with the finish line just before the tail joins. Then back to the start but on the right side of the road. You may now be able to understand why I went the wrong way on both of my practice runs, although on the second one I got lost going back to the start, and Richard couldn't work out his anti clockwise from his clockwise. Practice times were not particularly fast due to the wet track but by lunchtime the sun had started to show and the track dried out very quickly. The Beema was first to run and recorded 71.46 seconds, which was like a red rag to Bob the bull who posted 70.62. Both Ian and Kev could not face being beaten by a foreign vehicle but their enthusiasm got the better of both of them as Ian ended up four wheels off course and Kev delighted the crowd with a complete 540 in clouds of tyre smoke on their second runs. We all had a great day of competition at an event that will certainly become a regular in the calendar. Roger, a really good report on what was a brilliant event. Provided they retain the long figure of eight course I will definitely be signing on again next year! Could we just say thanks to the RSSC for putting on and organising this event so well. I managed to speak with a number of their members and we (The TRs) were thanked by all for making their meeting so much more interesting.